Nissan X-TRAIL -Vs- Mazda CX-5 -Vs- Kia Sportage — Auto Expert by John Cadogan - save thousands on your next new car! Thank you for a very informative review of the Nissan X-TRAIL on YouTube. We are in the market for a new SUV and we looked at the Nissan X-TRAIL Ti. It will be mainly suburbia driving with no off-road . I was wondering about your opinion of the Nissan X-TRAIL's CVT. I've heard a lot of opinions but the one we test drove today went very well. We thought the Nissan X-TRAIL Ti had a lot of good features. I currently own a Kia Sportage Platinum and was wondering how the Kia compared to the new X-TRAIL Ti. We also looked at the Mazda CX-5 but we found it too expensive for less offerings, when it is compared to the Nissan X-TRAIL. I'd appreciate any feedback you had to offer in regards to the Nissan X-TRAIL Ti, Mazda CX-5 and Kia Sportage Platinum. Which SUV is the better car for the price and option ? All this is a roundabout way of saying that while the Nissan X-TRAIL's CVT is nice enough to drive, there is no way to know anything significant about this generation of CVTs and their durability. Time, literally, will tell. Obviously the other two SUVs have conventional six-speed autos, and they function just fine. It's worth remembering that CVTs are adopted for fuel efficiency, not because they're nice to drive. And as you can see above, the Mazda CX-5 does a better job on the economy front. All three are very well appointed vehicles. More or less, they all come with a lot of fruit as standard. The Mazda CX-5's 2.5-litre petrol four is clearly in front - big capacity and direct injection delivers the most peak power at the most accessible revs. The Kia Sportage Platinum is the 'little engine that could', with outputs quite close to the Nissan X-TRAIL Ti's 2.5 - the difference there being the Kia is direct injected over the Nissan's older multi-port-style injection. Nissan's X-TRAIL has a handy 200mm in length over the Kia Sportage, and 100mm over the Mazda CX-5 - and nearly all that will be devoted to additional cargo space. This is doubtless because 2WD versions of the Nissan X-TRAIL are available with seven seats, and the space is needed to package the third seating row. Sadly, however, AWD and seven seats do not coexist in the Australian X-TRAIL range - so X-TRAIL Ti is strictly a five-seater, like the other two. In terms of tow capacity, Mazda's CX-5 leads Kia Sportage by a handy 200kg margin, and is 300kg ahead of the Nissan X-TRAIL - and I can't help but presume the CVT in the Nissan X-TRAIL functions as something of a weakest link there. Interestingly, the Kia Sportage is the only one of the three with a full-sized alloy spare wheel and tyre - a real advantage if you get a flat on the freeway (space saver spare tyres are limited to 80km/h). This is also good if you scrape the kerb while parking - at least you have a real, matching spare you can use. The Kia Sportage Platinum blows the other pair out of the water here, with the Nissan X-TRAIL well on the back foot. Seven-year warranty is more than double the Japanese pair, and a huge plus for those who will own the vehicle long-term. But service is another area where the Kia really shines. With a service interval of 12 months or 15,000 kilometres the Sportage is bang-on for average Australian driving (just under 15,000 kilometres annually, according to Ausstats). The Nissan X-TRAIL's six-month or 10,000 kilometre interval is an outdated joke, and Mazda CX-5 is about in the middle between the pair. Why? 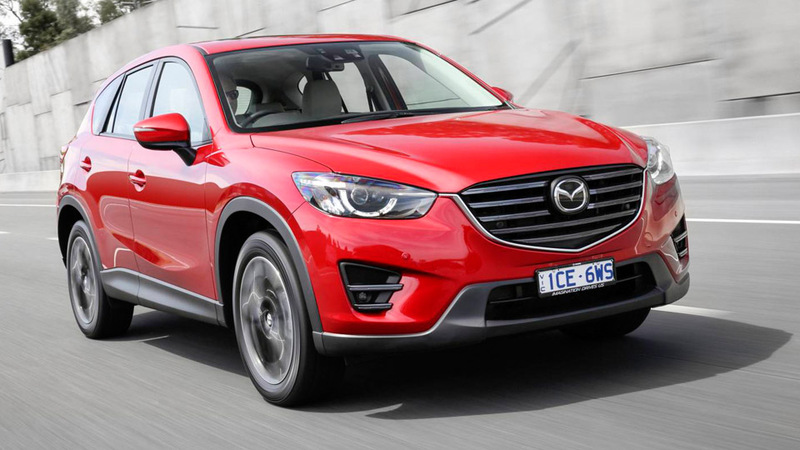 Because if a driver does 15,000 kilometres in a year in a Mazda CX-5 Akera, they will need a service every eight months on average (owing to the 10,000 kilometre service interval). When you look at all these things in total - this is almost a comparison between the Mazda CX-5 Akera and the Kia Sportage Platinum. The Nissan X-TRAIL is a nice SUV in isolation, but is out-pointed substantially by the other pair - in entirely different ways. The Kia Sportage Platinum is just as good as the X-TRAIL, or near enough to allow it the benefit of the doubt thanks to its incredible warranty and servicing spec, not to mention the significant cost saving. (It's $6600 cheaper, or 15 per cent.) The Mazda CX-5 on the other hand, is virtually the same price (the difference is under five per cent). It's better in almost every respect (save for carrying capacity and overall size). And then there's the question mark over the CVT's long-term durability.